The Client is a strategic staffing company for more than 17 years now, providing innovative human resource solutions to employers and job seekers, and serves as a trusted advisor to employers and professionals. They specialize in staffing for human resources, finance and administrative support, helping companies achieve objectives through simplified search for talent while making it easy for job seekers find the right job for them. The Client has helped many professionals build rewarding careers and employers hire the best talents through their “end to end” staffing services and solutions designed to simplify talent search, deliver results and grow their business, while marking key strategic functions required to achieve core goals. However, in recent years, work has become quite arduous in acquiring new and qualified clients. Competitors have become more aggressive, offering almost the same staffing service packages which gave target prospects a feast of options laid before them, which on the other hand took them a longer time to decide for the best provider. This urged the Client to decide on trying new marketing tactics that can help expedite their prospecting processes so a lead generation program was plotted to carry out the Client’s goal to acquire new and much qualified clients within a targeted period of six (6) months. Callbox’s Multi-Touch Multi-Channel Lead Generation Program was strategically designed to help clients get in front of their customers at the best time when they are most ready to listen and are most interested. This was made possible by Callbox for the Client through the Pipeline Lead Nurture Tool. In the campaign, the Client aimed to promote its core services: Staffing, HR Services and Consulting. These services were common in the staffing industry in the region but the Client wanted to inform target clients that they have an edge over other provides in addressing their HR requirements by doing a top to toe solution. Using the Pipeline Lead Nurture Tool, the Callbox team sent out initial email copies bearing the Client’s summary of services and solutions, website and query boxes. Email replies and actions taken by prospects such as clicking the website and queries were tracked real time for the agent to follow-up, either to call or send brochures. Calls were made by the Callbox agent and probing questions were asked to discover the prospects’ staffing needs and so that the Client may be able to tailor fit the best services and solutions for them to ensure quality on the organization’s human capital initiatives. The prospects’ answers were carefully and properly noted and all contact details were verified before the calls were disposed. After setting appointment with the prospects, the Callbox agent sent calendar invites to them as a reminder of the upcoming meeting, thereby avoiding any missed appointments. The campaign delivered a total of 36 solid appointments, 189 warm follow ups and 684 RFIs (request for information). The 36 appointments set by the Callbox team were companies that had varied staffing needs specifically on candidate screening, benefits and staff requests. With the Callbox Multi-Touch Multi-Channel Marketing Program and the Pipeline Lead Nurture Tool, the Client was able achieve its goal of acquiring new and qualified clients. Moreso, they are looking forward to acquiring more leads from the list of warm follow-ups they currently nurture which is more than enough to reach their targets before the six months are up. The Client is a strategic workforce planning company that provides innovative human resource solutions, and stands on a mission to help companies achieve strategic objectives through workforce planning, analytics and strategy. The Client has drawn many years of consulting experience and stacked a load of beneficial “end to end” HR services and solutions focused to better align, acquire, utilise and develop talent, targeting key and strategic functions required to deliver core goals. However, in the latter years of the company’s operation, the Client realized some exigencies in keeping up with the demands in acquiring customers. The slacken number of new customers in the database urged the Client to decide on taking new marketing options that can help them cope with the problem. A lead generation program was plotted to carry out the Client’s goal to acquire new and more customers. In the campaign, the Client aimed to promote its core services: Workforce Analytics, Human Resource Consulting and Workforce Strategy and Optimisation. These services were common among HR Consultancy providers in the region but the Client wanted to make a difference in addressing the customer’s’ HR requirements by doing a top-to-toe solution. Using the Pipeline Lead Nurture Tool, the Callbox team sent out initial email copies bearing the Client’s summary of services and solutions, website and query boxes. Email replies and actions taken by prospects such as clicking the website and queries were tracked in real time for the agent to follow-up on. Follow-up calls were made by the Callbox agent wherein probing questions were asked to discover the prospects’ HR needs and so that the Client may be able to tailor fit the best services and solutions for them. The key questions focused on monies invested in the people aspects and the quality of the organization’s human capital initiatives. The prospects’ answers were carefully and properly noted and all contact details were verified before the calls were disposed. Prospects who requested for more information were as good as completed leads. Brochures were set by the Client himself for the purpose of analyzing the prospect’s business status and to come up with the best answer to their questions. The campaign delivered a total of 15 solid appointments, 63 warm follow ups and 228 RFIs (request for information). The 15 appointments set by the Callbox team were companies that had varied HR needs specifically on workforce planning, management and reporting. With the Callbox Multi-Touch Multi-Channel Marketing Program and the Pipeline Lead Nurture Tool, the Client was able achieve its goal to acquire new customers. Moreso, they look forward to acquiring more new customers from their list of warm follow-ups that they currently nurture. The Client is Japan’s largest recruiting and information Service Company. They are focused on supporting a diverse range of work style though offering a wide variety of services including job advertisements, permanent placement services, temporary staffing services, outsourcing services, pre organization-related services, and development-related services in an effort to help realize a world in which people can freely choose their own unique work style. The Client also provides a broad range of services for companies, from employee recruitment to development and assignment. Through their diverse services, they are committed to offering the best HR solutions for business operations. The Client was planning to launch a new product in Singapore and they didn’t have a marketing team to help them engage with customers. Hoping to reach out to prospects and meeting their deadline, the Client decided to outsource to a company that specializes in reaching new markets and has all the marketing tools including database, email support and social media to manage a campaign and help generate potential clients for them. Before the campaign commenced, the Client highlighted how crucial it is for them to reach their target prospects for the launch of their product. Prior to signing up with Callbox, the Client had planned a marketing strategy of their own, which was focused on different target locations per week. They decided to apply this strategy to their first Callbox campaign. Contacts were profiled properly and were sent out an email. To get more interested prospects, the team needed a sustained and focused effort. However, despite much effort exerted by the team, the Client’s marketing strategy gave them less time to nurture their warm prospects, which resulted to failure in meeting the Client’s campaign expectations. Jumping from one target area to another from week to week gave them less time to reach out to the right people. The availability of prospects had to be put into consideration as well. Having limited time to run the campaign affected the conversion rate. Many prospects considered looking into the product, however, most of them didn’t want to commit yet. Right timing is the key. Running a 3-week campaign on a lean month, when most of the prospects were on vacation, contributed to a lower-than-expected turnout. Callbox’s multi-channel approach, whereby the team sent out emails to warm prospects prior to the start of the campaign which helped generates positive replies and was converted to appointments. At the same time, the team tried different approaches to touch base and follow up with them while running the campaign. The Client ran a 2-week campaign, this time with 4 agents focusing on one location. The team conducted regular status meetings with the Client to provide updates and keep track of their course of action. With the help of the Callbox Pipeline Lead Nurture Tool, the team was able to create a scheme and set a timeline that helped achieve the desired results within the time frame specified by the Client. With Callbox’s experience and the team’s expertise in troubleshooting different types of campaigns, together with the Client, they managed to create a customized program to meet the Client’s target and expectations. Running a multi-channel marketing campaign with the aid of the Callbox’s Pipeline Lead Nurture Tool, the team managed to deliver a higher number of qualified appointments than they would have without it. As a result, the Client decided not to accept more office appointments and advised the team to convert them to leads instead as they no longer have enough people to handle all appointments delivered. 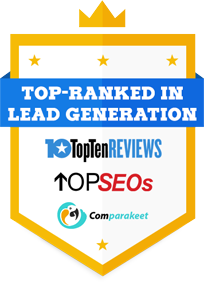 Currently, the Client is nurturing 178 leads, 37 of which are interested with the product and agreed to meet with the Client’s sales team, 75 warm leads who are interested to know more about the product and 66 leads which can be followed up through email. These impressive results prompted the Client to signify his intention to sign up for a long term contract by the 3rd quarter of this year. The Client is a supply chain solutions provider which is one of three interconnected networks under a global sourcing company with 30 years of experience in licensed and bonded warehousing and supply chain services that has anchored long-term clients from the Retail, FMCG, Footwear & Apparel and Food & Beverage industries. It prides itself in its team of experienced logisticians and endless pursuit to technology innovation to continuously provide hybrid supply chain solutions including complex contract logistics in warehousing, very high range and volume of value added processes, local distribution, brokerage and international import and export freight services. The Client saw that the competition in the fast-changing logistics industry was becoming intense as more and more industry players joined the race, and felt the need to become more aggressive and go further down the track – increase brand awareness and widen their reach in the ASEAN market. However they lacked the energy – the marketing strategy that would fuel them in running the course. Callbox had the answer. The Callbox team leveraged their multi-channel marketing program and carefully strategized to achieve the best results from each element – voice, email, social, web, and mobile. Concurrent with the daily calling was the customer profiling activity – updating company name, contact name, address, phone and mobile numbers, email and social media accounts and industry category or SIC code. As more contacts were updated and verified, more meaty DM conversations transpired. These conversations gave the Client a better opportunity to analyze customer needs, anticipate challenges, design options and set up contingency plans. Another factor was the increase in volume of email communications delivered and received – references that bore relevant information on the Client’s fast, reliable, and cost-effective logistic solutions. The email marketing has made the Client’s brand more known to a larger target audience which apparently drew email replies from interested prospects. Appointment setting was boundless – the caller was given the options of either booking an office appointment or setting a phone meeting (whichever is preferred by the prospect) anytime during business hours. Such flexibility drove a good, increasing number of highly-qualified leads for each campaign month. Customer Profiling improved data quality and increased accessibility for the Client to engage with a much targeted audience. Email Marketing boosted brand awareness and heightened interest among target customers. Appointment Setting widened their market reach and accelerated lead acquisition by 25% in the ASEAN market. This global supply chain solutions provider is a strong and powerful leader in the logistics industry, empowered to compete, innovate and fearlessly take risk at any course of the business. Callbox’s multi-channel marketing program has indeed energized the Client’s aggressive campaign to run faster and finish off with a more targeted database, boosted brand awareness and widened market reach in the supply chain solutions industry race. The Client is a global media company providing more than 30,000 marketing programs from the Fortune 50 to emerging start-ups for 17 long years now. Their core services include targeted content, active audiences and innovative capabilities that run via a platform, to assist their clients in engaging with revenue-driven technology marketing programs. To profile the data and conduct a survey among the Client’s existing customers. The Client provided Callbox a list of their existing customers to be updated and profiled. The data profiling campaign wasn’t ran generically as merely updating wrong information, but rather implemented based on the Client’s specific process that required further research and data recording to complete the action. Note: The caller must not find/replace a contact and email address other than what’s in the list. Aside from updating and cleansing the list, a step-by-step Question-&-Answer form was to be filled out by the caller in a spreadsheet that will detail how the data verification was done for each call. Question: Does the business plan to purchase or upgrade big data technologies in the next 12 months? Question: How does the business deploy server resources in the next 12 months? Question: Does the business plan to upgrade or invest in desktop virtualization solutions within the next 12 months? Question: Will the business be implementing or undertaking a DR related project in the next 12 months? Answers to the survey were uploaded via links provided by the Client. The results of all the three concluded campaigns were precedent to the upcoming campaign which the Client will be launching early 2016, with the same Callbox team. Callbox is customer satisfaction-driven. We translate your business thoughts into ideal opportunities, project plan schemes into materialized tasks, and goals into achieved targets. The Client is a leader in Precision Transcription & Stenography services in Australia. For more than 50 years now, the business holds the reputation in quality that has been built on strict, on time delivery, and accurate professional transcription for events, meetings, interviews, arbitrations and courts throughout the country. For the leadoff campaign, the focus was to set appointments with specific decision makers for specific industries. In those meetings, Client introduced and discussed the feature and benefits of VIQ Solutions – the world’s leading expert in digital audio, video and evidence capture and management solutions. VIQ Solutions provides digital recording applications that allow multiple channels of audio and video recordings to be recorded simultaneously with annotations and other information attached to it. The project plan to partner with a lead generation company was brought about by the Client’s challenge to be able to get through arduous targets like Legal, Medical & Investigation. These are industries that require detailed transcription/dictation tasks as they deal with sensitive and delicate matters. A full-package, multi-channel marketing program was provided by the Callbox team. An agent who called for the campaign for 8 hours everyday. Despite the agent starting out with limited knowledge on transcription services, through the Callbox leader’s orientation and training, as well as the agent’s interest to learn the mechanics and myriad of applications of such a service , the agent achieved the Client’s desired level of proficiency in speaking with prospects about VIQ Solutions. Filtering a database for the Client’s required target industries was quite a challenge for the Callbox team, as the number of these type of organizations in a country or region is quite below standards, as compared with consumer-centric businesses. But the team still managed to work well with the approved database. The calling script served as a guide for the caller to keep himself aligned and knowledgeably-sounding in offering the product & services’ value proposition, and setting solid appointments with target decision makers. The Callbox team built and managed the LinkedIn account, which was approved and kept monitored by the Client at which conversation threads with connections were viewed. Email templates were drafted by Callbox and were approved by the Client. The templates varied in approach depending on the call disposal set by the agent on each call. The weekly reports sent to the Client discussed about statistics and feedback about the campaign. Challenges encountered by the caller in his calls were noted, and corresponding action plans were suggested and implemented for each. A calendar invite was utilized to confirm set appointments with interested prospects. And if by chance, that a prospect declined the calendar invite, the Callbox team worked out a follow up call for a reschedule, and made sure that no appointment/lead is lost. Callbox was able to open the doors for more opportunities for the Client to reach quite elusive targets in the tribunals and local councils in Australia by adding 9 solid leads to their existing client list. Client signed for another contract, which was for another company under his management and which offered enterprise audio and text management products and systems. Client is currently nurturing all the leads and maintained communications with Callbox for possible campaigns early this year. Callbox opened more doors of opportunities for the Client by complementing its business objectives with a multi-channel marketing scheme. The Client is an exhibition and conference pioneer that withstood time and tide to become Singapore’s top and most successful trade event organizer today. They stage trade exhibitions that provide dynamic platforms for effective networking and business opportunity growth to the largest and longest running key industry sectors in the region. Their four-decade reign as leader in the exhibition industry brought numerous recognition from different awardgiving bodies like the Exhibition City Approved International Fair (AIF) Scheme, and the Singapore Business Events Awards. Such has gained them much trust from the industry sectors they serve and increased their clientele list over the years. Indestructible they may seem to have lived with a four-decade trade leadership in the region, what good reason did they have to still take the option to enterprise telemarketing into their current strategies? Why not stick with the conventional, but proven effective scheme of 40 long years? The first couple of Call-to-Invite projects aimed to gather attendees for Asia’s largest and most comprehensive business networking event for the Global ICT industry, which was participated in by international satellite communications and services companies in Asia, and professionals from Broadcast, Production, Post Production, Digital Media, Entertainment, Houses of Worships, System Integrators, Rental Houses, and Education. The event was not launched for mere knowledge enrichment and ideas sharing purposes for the attendees, but a plenitude of beneficial platforms for ICT professionals were introduced like Big Data Analytics, Cloud, eGovernment, eServices, Security, Smartcard/RFID and Wearables. Also featured were the latest technologies in 3D Printing, IoT, M2M, Mobile Apps, OTT and more. The second wave campaign engaged key decision makers in the manufacturing industry to access the latest precision engineering and machine tool technologies available in the global market, and key decision makers from the international oil and gas industry to showcase a comprehensive product innovation. Local parts and components manufacturers and service providers showcased their expertise at the Capabilities Hub, which brought prospective buyers closer to the suppliers via a single platform. The preceding call-to-invite campaigns were successfully rolled out by the Callbox team which made an abounding progress in the client’s database. Both Callbox and the exhibition leader were responsible team players in completing the project thru multitouch, multichannel marketing tools and strategies. The Callbox Pipeline, Callbox’s Lead Management and Marketing Automation platform, stored the client’s big amount of data. The callers updated the contacts with the most current information they uncovered during the call outs. Hitting two birds with a single stone – callers invited the prospects to attend the event and preregistered them on the client’s behalf and updated/profiled the list at the same time. The Lead Nurturing Tool was activated. A scheme was customized to send out email invites to prospects, and once the invite was opened and read, a notification prompted the callers to do a follow up call and get the prospect pre-registered. DM Outreached. Client’s own database came up to nearly 20,000,but almost 50% of that number was deemed “Un-contactable”.Both Callbox and the client agreed to add target contacts/job titles for the expansion of the list which resulted to a wider market reach and more email invites sent to target decision makers. A profiling campaign was set off by the client at the last quarter of 2015 which aimed not only to keep their database accurate, profiled and cleansed, but to prep things up for the next coming edition of events in 2016 and 2017, and which this exhibition expert sets to run again with Callbox. So, ask again what good reason did this trade and exhibition expert thought of working with Callbox, despite their years of experience and proven expertise? Clearly, the fitting reply can only be Why not? The Client is a new electricity retailer based in Sydney. The Client is rapidly hitting the Australian market with their integrated energy solutions. The current lead generation campaign they are running with Callbox is beaming with rays of potential in providing full energy service to Australian consumers. PIC for the company’s electricity bill, Owner, Manager, Office Manager, Accounts, Finance, Procurement Manager, Facilities Manager, etc. The initial, single seat campaign period was launched in July 2015. The main call objective was to set a face-to-face appointment for the Client with prospects bearing the discussion on the best solutions to lower down energy bills. The initial production generated 28 leads. This impressive production of leads from the initial period of calling inspired enough trust and confidence from the Client that they recommended our service to their sister company, a Clean Energy Regulator service provider. Callbox worked well and delivered the same amount of hard work and professionalism to the latter which resulted to a very good number of leads of 150, and renewal for another campaign contract. The second part ran with 3 calling agents, and added 3 more campaigns which the Client branded as “special campaigns”, generating a total of 79 leads which finished with 96 leads. All these were achieved through the collaborated resources of both the Client’s sales team who drove so much vigor in sharing knowledge with the callers, coupled with Callbox’s multi-channel marketing processes. How much time does it take for a business to grow and step into the ladder of success? This energy retailer expert rolled 3 significant factors into 1 package and took a big leap as the leading energy retailer. Before each campaign starts, the client spends ample time to train the callers about their products and services. Also, the client’s sales team directly coaches the agent on call handling, like the proper approach when speaking with prospects and effective game plans that would bring in close-to-sale contacts. The campaign materials like the script, brochures/collaterals, calendar invites, database and email templates, go through their meticulous checking and approval before anything else go live. The client makes it a point that the call activities are focused on the target market. Such careful planning makes the process of reaching the target prospects an easy task for both teams. What makes this energy retail expert stand out among competitors? Let’s just take 3 answers among the many. They do careful analysis of the prospects’ current energy cost & provide them with customized, competitive solutions. Customers who are in contract with their current providers are given the best offer that is hard to decline. Prospects that said “no” during the telephone conversation with the agent but expressed their willingness to explore other options in the future, are saved and treated as “follow-ups”, instead of discarding them from the target list. Now running is campaign month 4. With the planned action to integrate a power dialer tool with the current resources being used, the quality of leads generated is positive sign of a long term relationship between the client and Callbox. This leading energy retailer is taking delectation on each campaign month that we run for them. They value each lead delivered to them by the calling team and take pride in the glowing work relationship they have with Callbox. The Client is a worldwide market leader in online hotel reservations; provider of fast, secure and easy-to-use booking system with access to over 35,000 hotels, inns, B&Bs, and resorts. The Client was losing online sales due to both seasonal and irregular network congestion. They believed that frustrated customers were abandoning the sales process when browsing seemed too slow. Factors beyond their control did not allow them to “fix the internet”. The Client believed they could save these abandoned sales by making their online reservation system available over the phone, allowing potential customers to talk to a live operator 24/7. They decided to provide a prominently displayed toll-free number on their website believing that live operators could keep the customer on the line until closing the sale during congested periods. By electing to outsource, they hoped to find a single experienced call center could cut costs by managing both incoming phone sales and customer service for cancellations or reservation modifications. By boldly choosing to support their online business with live operators, they discovered that far from cannibalize their online channel, they strengthened it, even created a new channel of dedicated phone customers, and simultaneously offloading management of customer service requests to Callbox. Customer confidence increased phone channel sales across the board by attracting customers who had not and would not use the online system. Repeat sales increased due directly to Callbox agent friendliness. Customers regularly requested the Agent’s name, and requested the Agent by name on subsequent calls. The Client is one of the premier retailers of Dish Network, the United States’ lowest priced all digital satellite provider. Dish Network offers a variety of HD programming such as theater-quality movie channels, educational and nature programming, Pay-Per-View HD movies, and HD broadcasts of special events, including concerts, boxing matches and professional sporting events. The Client offers TV and entertainment packages that are put together to give choice and value, loaded with popular options for a low price as well as very affordable equipment upgrades. Providing satellite sales, installation and service throughout the US was not easy for the Client which was a young company. It saw the need to grow, not only in terms of client base but in customer service capacity as well, in line with its goal to provide outstanding service to its customers. The Client faced stiff competition from huge cable providers all over the US so it needed a major marketing campaign to introduce its company, its offers and retain a loyal set of customers. An attempt at in-house sales operations was made by the client, but did not generate as many customers as expected. The Client saw the need for a partner to reach its target market and eventually, hit its sales target. In order to gather interest for the Client, Callbox launched a Lead Generation campaign in April 2006. Since the Client had in-house specialists, the task of Callbox agents was limited to gathering prospects by generating interest in the Client’s offers, and forwarding these prospects to specialists who closed the sales. A total of 10 agents consisting of 7 openers and 3 closers handled Client’s account. The 6-month lead generation campaign by Callbox customer representatives involved the introduction of the company, its offers and basic installation information. After a 6-month lead generation campaign and 2 months of pre-close transfers, the Client requested Callbox agents to close deals as well, a significant show of confidence in Callbox agents. The Client was able to cut costs by reducing in-house sales support and rely solely on telemarketing in order to sign and maintain customers. Growth. At the start of the campaign, the Client’s target market was limited to Southern California. Its client base has spread over 13 states, including Texas, Arizona and Oregon. The Client achieved a hefty 50% increase in installations per day. In a display of satisfaction with the results of the Callbox campaign and as a result of the good relations between Callbox and the Client, its Sales Director scheduled a week-long visit to the dedicated team, and performed in-depth sales training at the Callbox on-site training facilities. The training focused on sales techniques for both sales coaches and agents. The principles learned were shared across all applicable Callbox teams. This is the Client’s first experience with outsourcing, and Callbox is proud to be chosen. The Client is an agency under the Ministry of Trade and Industry spearheading the development of Singapore’s external economy wing. Its mission is to promote the overseas growth of Singapore-based enterprises and international trade. 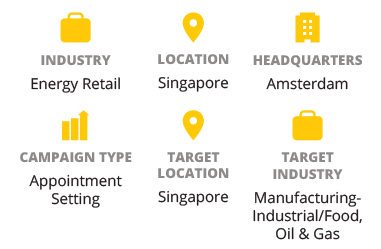 With a global network of over 30 locations, the Client offers services to help Singapore enterprises export, develop business capabilities, find overseas partners, and enter new markets. They work to position Singapore as a base for foreign businesses to expand into the region and Singapore-based companies. The Client’s primary objective was to acquire foreign leads to participate in their ‘business matching’ trade portal. They targeted importers, distributors, wholesalers and manufacturers all over the US, to seed business opportunities and partnerships. Callbox launched a Foreign Lead Generation Campaign. Hot leads were qualified and matched with suitable Singapore-based enterprises. If requested, Callbox also sent the prospect invitations and online brochures. With the Callbox team delivering a large number of leads monthly, the Client has been enjoying an increasing number of registrations on the online portal, significantly expanding its customer base. The Client’s Business Matching Group expressed satisfaction with the leads generated and the consistent professionalism and quality service shown by the Callbox team. As a result, the Client still continues to engage the services of Callbox in foreign lead generation. Today, Singapore’s most comprehensive business portal lists over 100,000 companies and is growing daily.